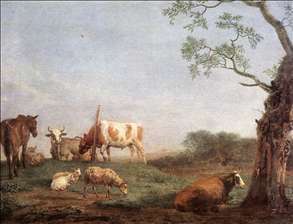 Dutch painter and etcher, part of a family of painters, draughtsmen and etchers, son of Pieter Symonsz. Potter. 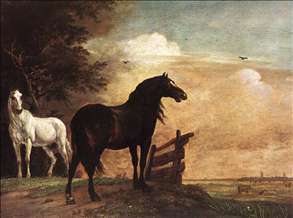 He is celebrated chiefly for his paintings of animals. 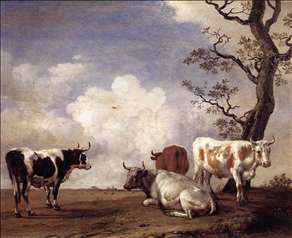 Animals appear prominently in all of Potter s works, sometimes singly but usually in small groups silhouetted against the sky, or in greater numbers with peasant figures and rustic buildings in an extensive landscape. 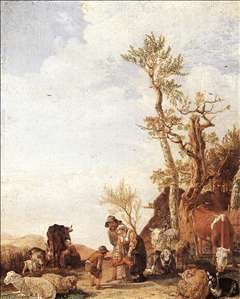 Potter is one of the minor Dutch masters. 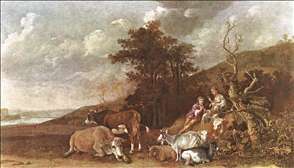 Potter entered the Guild of St. Luke at Delft in 1646. 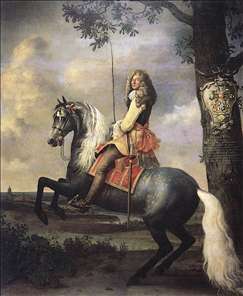 In 1649 he moved to The Hague, where in the following year he married Adriana, daughter of the architect Claes van Balkeneynde. In 1652 Potter settled in Amsterdam. 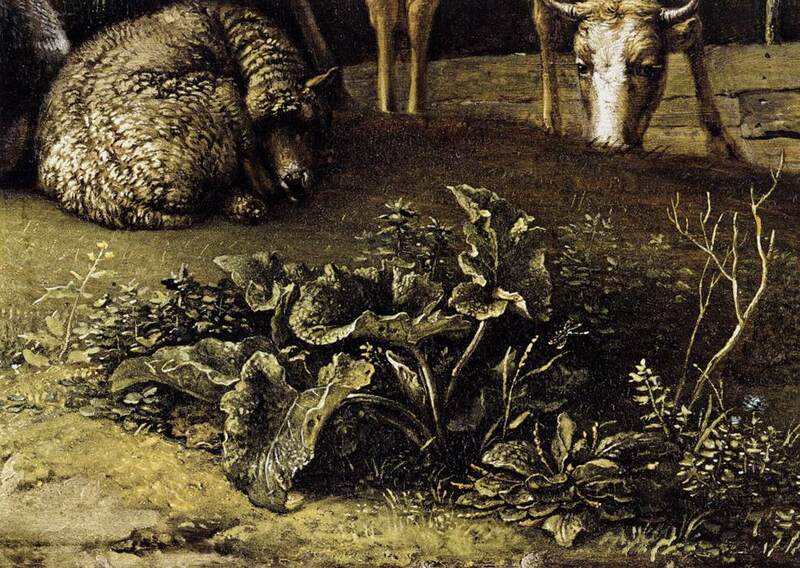 He probably received his early training from his father, the painter Pieter Potter (c. 1597-1652), but his style shows little dependence upon that of earlier masters. 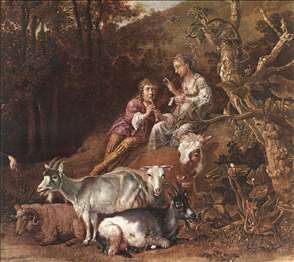 In so short a career there was little development in style between the earlier and the later works, but 1647 seems to mark a peak in his achievement, for many of the finest paintings bear this date. 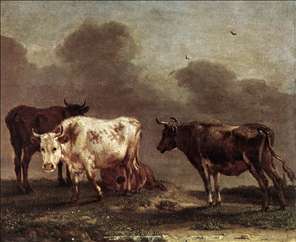 Among works that depart from his normal scale or style, the huge Young Bull (1647; Mauritshuis, The Hague), which is life-size, is his most celebrated, though not necessarily his finest work, while Orpheus Charming the Beasts (1650; Rijksmuseum, Amsterdam) is an excursion into a poetic world. Potter s etchings of animals show all the skill and sympathy of his paintings. 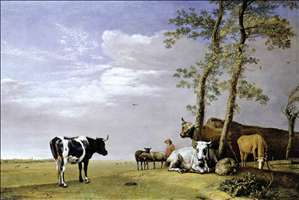 See more details about "Cows in a Meadow"
See more details about "Diederik Tulp"
See more details about "Four Bulls"
See more details about "Horses in a Field"
See more details about "A Husbandman with his Herd"
See more details about "A Husbandman with his Herd "
See more details about "Peasant Family with Animals"
See more details about "Resting Herd"
See more details about "Landscape with Shepherdess and Shepherd Playing Flute"
See more details about "Landscape with Shepherdess Shepherd Playing Flute "